Getting more than a couple of people in more than a couple of locations onto a single phone call used to require a conference calling service. Not anymore. The iPhone makes creating and hosting a small conference call very easy. And forget about dialing into special phone numbers, having to remember long access codes, or paying for conferencing. All you need is an iPhone and everyone's phone number. Conference calling features are built into the iPhone's Phone app. In the U.S., it can support up to 5 callers at once on AT&T and T-Mobile and up to 3 total callers (including you) simultaneously on Sprint and Verizon. If you're using Verizon HD Voice (formerly known as Advanced Calling) on an iPhone 6 or 6 Plus or newer, the limit is 6 callers. Learn how to enable Verizon HD Voice here. The instructions in this article were written using an iPhone running iOS 12. However, the iPhone has supported this kind of free conference calling for many, many years and on many, many versions of the iOS. So, if you've got an older version of the iOS on your phone, the steps listed here might be slightly different — but free conference calling is still available to you. After the first participant answers, tap the Add Call button. If you're already on the call and another participant calls you, tap the Hold Call & Answer button that pops up on the screen. When you've answered that call, tap Merge Calls to add the new caller to the conference. Not sure how to decide which phone company will be meet your needs? For help choosing the best phone company for your iPhone, read this article. On the same screen where you enter private conversations, you can also disconnect individual callers. Next to each name, there's an End button (on iOS 7 and up) or a red phone icon (on iOS 6 and earlier). 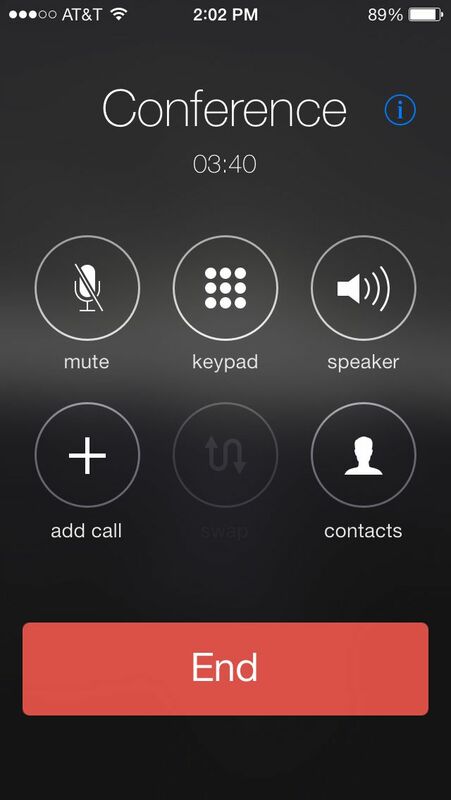 Disconnect a caller by tapping the End button (on iOS 7) or tapping that icon and then tapping the End button (on iOS 6). This disconnects that caller while leaving everyone else in the conference. You can also choose to flip between two calls without conferencing them together using the Swap Calls button. If you're already on a call and have a second call coming in, simply tap the Swap Calls button to put the current call on hold and switch to the other. Tap the button again to reverse the process.